After showing off my new art cabinet a week or two back, I was having a chat with some friends on twitter and promised a full studio tour at some point. Then last week, I received an email invited me to be part of WeWork‘s “Where We Work” series, and since I’d a) promised a tour anyway and b) had a few slots I needed to fill for Blogtoberfest, I would like to officially welcome you to my humble corner of our home, where all my creating and daydreaming and plotting happens. 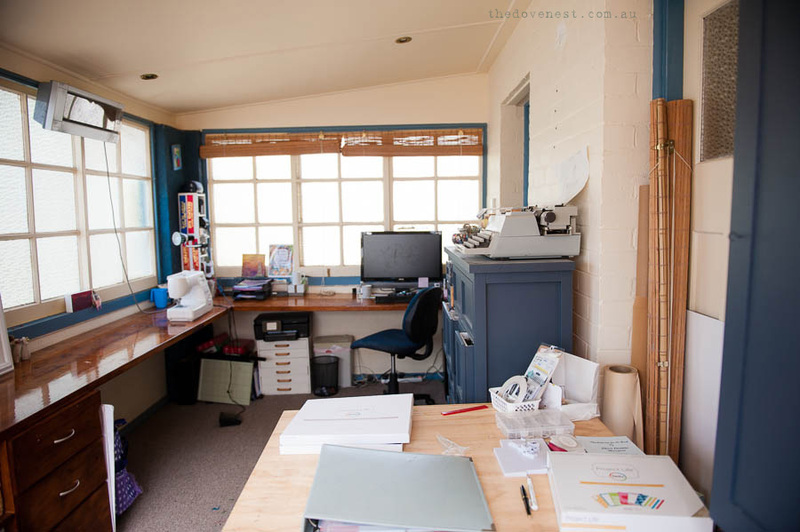 The “creative” half of my studio, where all the fun stuff happens, and all the stuff to make the fun stuff resides in a form of organised chaos. The wall mounted cabinet on the left between the two doors stores all a lot of my art supplies, and the large cabinet in the front left stores my fabric, patterned paper and stamping/scrapbooking supplies, as well as tools best kept out of reach of little hands, like my bookbinding awl, and pliers/sidecutters for jewellery making. Everything else is stored on the under-desk bookshelves in a hodpodge of boxes and containers. That is definitely on my to-do list to convert to drawers and reorganise! The canvases on the left hand wall are preschool artworks by my big boys, the canvas on the right was a gift from Car, the photo frame currently holds photos of my daughter from when she was a baby but desperately needs updating, and in the far right corner are two bunches of flowers – one is the first bouquet of roses my husband gave me (dried, obviously), and the other is a bundle of artificial flowers left over from our wedding. Up the other end is the business end – my computer where I blog and edit photos and write and waste far too much time on Pinterest, a couple of artworks that are yet to find a home, and my sewing machine. 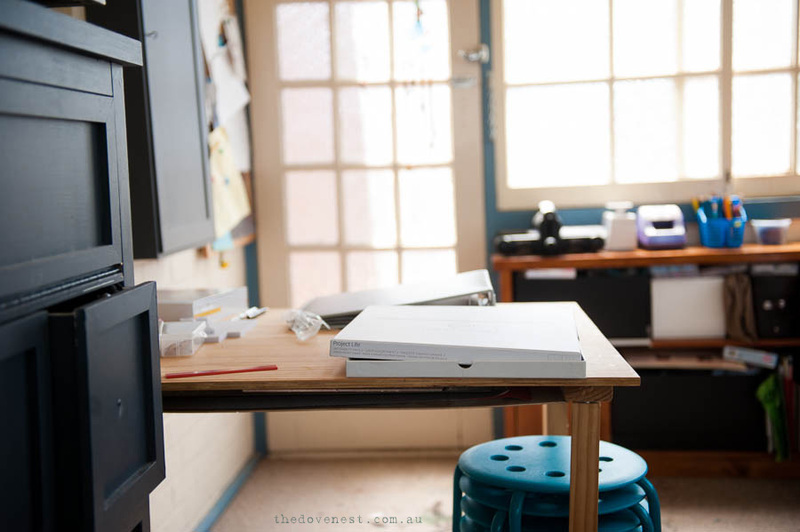 My main workspace – this table was built but my husband for me, and it is where all the fun stuff happens – over the weekend when I was preparing for this post, it was Project Life catch-up. Yesterday it was sewing a quilt for a blog post tomorrow. Today it was a run of letterpress notecards for a custom order. This table sees a lot of variety, and it’s paint covered surface tells a tale of many productive hours spent standing over it. The collection on top of the large cabinet is a bunch of things that make me happy – a bowl of washi tape and a bowl of buttons. A set of photo frames I received for my 30th birthday – one with a photo with my three big children from when I was pregnant with the fourth. A drawing I did playing around with pastels one day. A little silk ribbon embroidery. A piece of patterned paper, a button I bought from our local library blue-tacked to the front. A figurine version of yours truly from my 30th birthday cake. A (working) typewriter. To go above it on the wall I have a fabulous mini quilt in grey and yellow and lime that I can’t wait to see up there to really brighten things up. 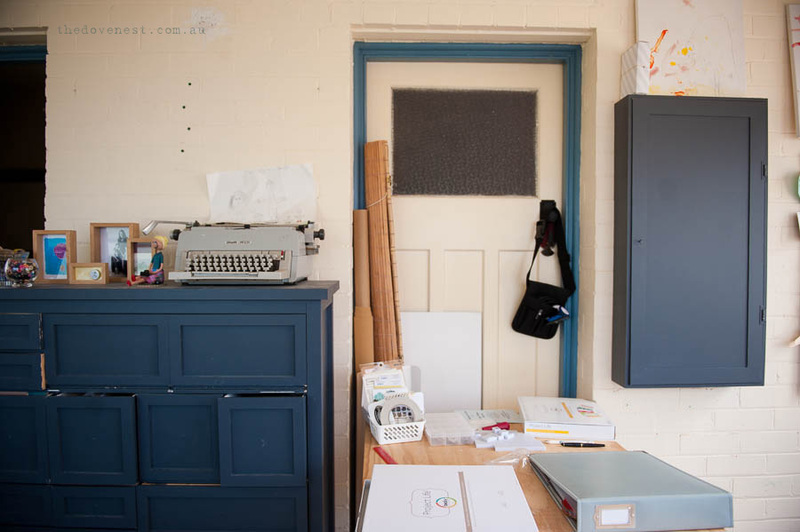 And under the table is my newest organisational weapon (which I am forever in search of the “next big thing” that will help me keep my space tidy & organised) – an extra shelf to store large papers and my cutting mat and rulers. And that’s about it! 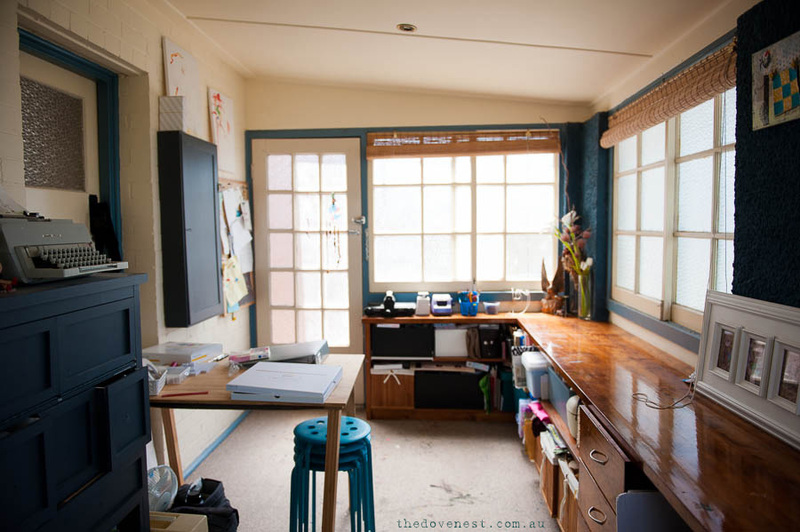 It’s not a huge space, and I still have a bit to do before it is completely “done” – I have a children’s craft desk in progress and replacing the carpet with painted floorboards is a job for the holidays. Drawers for the bookshelves are a longer term project. But for now, it’s my space and it is where I spend time indulging my creative side, and the enjoyment I get from my tie in here outweighs the things that need to happen “one day”.